Bulk 15 Oz. ceramic mugs, "El Grande", Custom Imprinted in Bulk.15 oz El Grande 4-Color Process Sublimated Mug. A large capacity ceramic coffee mug for the serious coffee drinker. Add your full color background and company logo to this quality ceramic cup to achieve billboard sized advertising awareness that really stands out from the crowd. Price includes 4-color process. Must specify 2 sides or only 1 side will be printed. Budget Prices in the USA and Canada for wholesale personalized 15 Oz.ceramic mugs. American clients pay no taxes. Prices include your 1-color custom imprint. 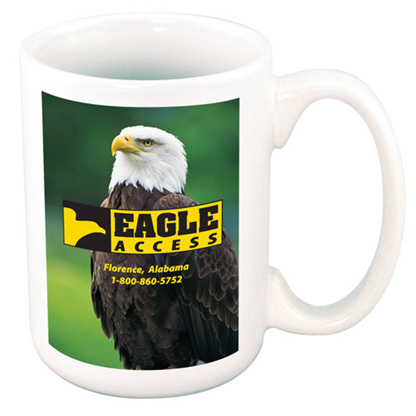 Add $0.45 per ceramic mug for each additional imprint color. Please note that you need to order in multiples of 36: we ship 36 ceramic mugs per carton. DAMAGE RESISTANT CARTON: add $5.00 per 36 mugs. Wraparound: 3" H x 7-13/16" W logo area, 3-1/2" W x 8" W for background. Packaging: 36 units per carton of 42 lbs. &white camera ready, same as supplied for screen printing process. Because it is dye sublimation using 4-color process technology, exact color replication or exact PMS color match is not possible. Colors may vary slightly within a run or on repeats. Imprint will be a close facsimile, but not an exact reproduction of the original art. When submitting art, increase background imprint area shown above by 1/4" for bleed purposes.